What an absolutely splendid idea from our spanking new friend Bradley at The Personal Barber. It's always rather thrilling to receive a parcel in the post (unless it's ticking goes the old joke). Sign up with the The Personal Barber and they will dispatch a box of shaving products to your door each month. 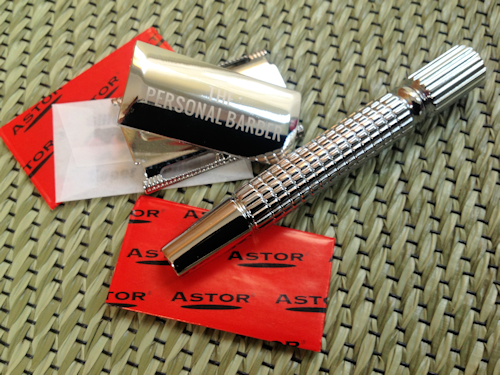 For the the first month The Personal Barber sets up with everything you need to get started. For the months that follow each box contains a new set of grooming products to keep your facial hair interested and the skin below in tip-top condition. So you get a traditional three-part safety razor and a shaving brush in you first box, along with blades and soap, and — my favourite element — mystery products. If you're new to safety razor shaving, he also provides instructions with the first box. 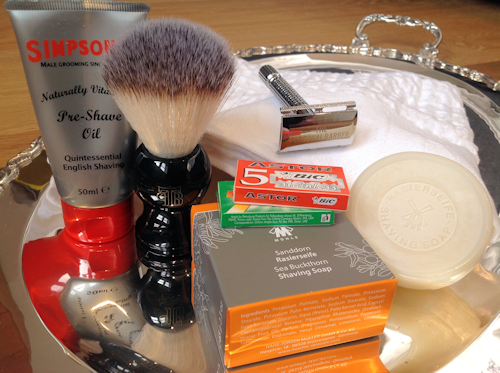 If you already have a favourite razor and brush, and don't require another, they are swapped with other items. The mystery deepens with each subsequent box. Bradley knows the shaving world inside-out and scours the globe for the best in grooming products that might include aftershave balms, colognes, alum, pre-shave oil — all manner of man-face merchandise. From the box you see here — which I served to myself on a silver salver to heighten the ritual — we have a rather excellent shaving towel from Mühle of Germany. This was a revelation in itself. I've long used flat, non-fluffy towels in my grooming rituals as you can soak them in hot water and press them over your beard pre-shave, and they don't leave bits of towel on your face when drying post-shave. This MÜHLE towel has a waffle-like texture that makes it slightly spongy and totally fit for purpose. Excellent. 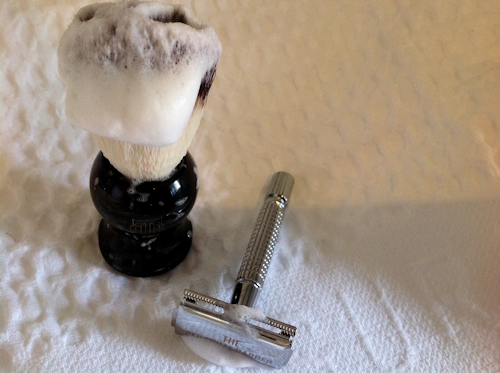 Bradley chose the shaving brush as it has a softness between boar and badger hair. I'm used to badger hair, but found the brush lathered and held the soap well. It was nice to see Simpson's represented in the box. A combination of their pre-shave oil and the MÜHLE Sea Buckthorn shaving soap applied to the fizzog delivered the smoothest of scrapes with the blades provided. This is a great way of trying the widest selection of grooming products — like having a personal barber in your home, as the name suggests. You just need to add your own conciliatory responses to the conversation. Tweedy's Thoughts: Perhaps members could purchase additional boxes as presents to introduce family and friends. And maybe there could be a turbo-charged initial option with a choice of razor, such as an Osterley, and grades of badger brushes. Sounds awesome. I have the badger and blade essential boar brush and I love it. I also have a tradere safety razor and it works great. However, I'd love to try out new products and different kinds of razors and shaving creams. It's always fun to try out new brands.